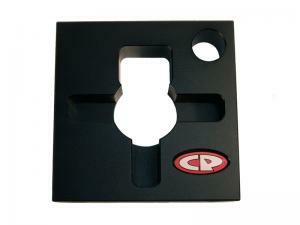 This handy tool holds your CP tank regulator securely while you remove, install, or work on the regulator. Simply attach the tool to your workbench with two 5/16-18 screws (not included) or clamp it in a vise. New design is adapted to fit CP regs and most regulators by other manufacturers (does not fit Crossfire or Guerrilla Air.) Visit the CP YouTube channel for a "how to" video.